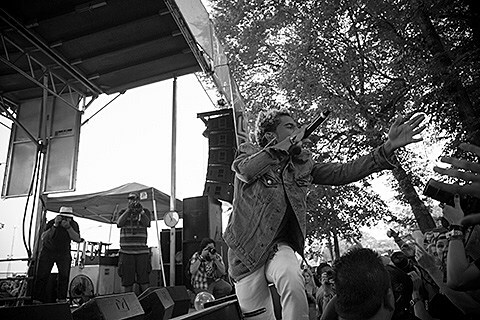 Chicago rapper/Chance the Rapper associate Vic Mensa has been on the rise this year, doing pretty cool things like playing “Clint Eastwood” with Damon Albarn, touring with Disclosure, and then making a song that sounds influenced by touring with Disclosure. He now just released a song with another hot electronic producer Kaytranada (who will release an EP on XL and tour later this year). It’s called “Wimme Nah” (as in, now that he’s getting hyped, all these people are with him now), and you can stream it below. Video has also surfaced of Vic taking on The White Stripes’ “Seven Nation Army” at his Lollapalooza set this past weekend, and you can watch that below too. Vic was in NYC last night (8/7) playing the FADER / Goose Island show at Rough Trade. (Anyone catch that?) His tour continues tonight (8/8) in Philly, playing the first of four Mad Decent Block Parties that he was recently added to (in place of his pal Chance the Rapper who dropped off). Vic’s also on the one happening in Coney Island’s MCU Park this Saturday (8/9) with Big Gigantic, Dillon Francis, Diplo, Dougie F & DJ Fire, DJ Snake, Flosstradamus, Grandtheft, Walshy Fire and Young Kyle 187.